With a shiny veneer and ‘scratched effect’ surface, Starfish frames are both an attractive and adaptable choice for any interior. Nielsen Starfish frames come in a variety of colours and sizes and are ideal for displaying awards and certificates. 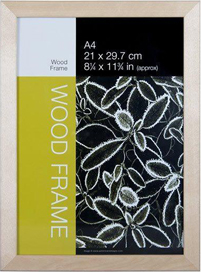 With a shiny veneer and ‘scratched effect’ surface, these frames are both an attractive and adaptable choice for any interior. If you’re looking for something a bit different or a smaller, freestanding frame for bedside and coffee tables, the Starfish is a great option. These frames also make lovely gifts.